The 2012 RI Convention in Bangkok, Thailand, has drawn to a close. But the event is still leaving a big smile on many people’s faces. 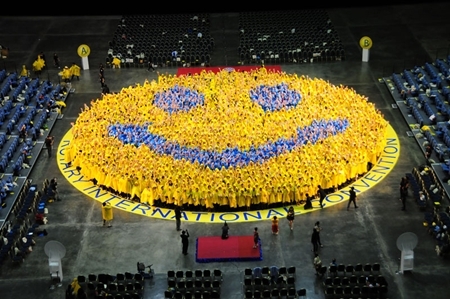 On 7 May, exactly 2,012 participants put on yellow and blue jackets and hoods to form Thailand’s Biggest Smile at the Impact Arena for Ripley’s Believe It Or Not. The number 2012 reflected the convention year and the year Rotary members celebrated exceeding Rotary’s US$200 Million Challenge for polio eradication. The activity also fit in with the RI Convention concept of “The Land of a Thousand Smiles” which conveyed the friendliness of the host country and its people. 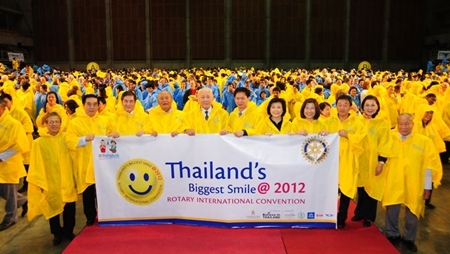 Exactly 2,012 participants form Thailand’s Biggest Smile at the 2012 RI Convention in Bangkok. The event received major media coverage in the Thailand area and beyond. A photo also appeared on the Photo Blog of msnbc.com, giving excellent exposure to Rotary and its End Polio Now message.